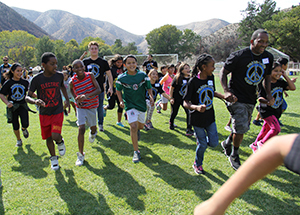 This summer the kids living in Watts’ public housing developments have the chance to go to camp through the Harold Robinson Foundation, where they can experience nature, build friendships across gang territories, learn and grow, and - perhaps most importantly - just get to be kids for a week. In an effort to support this amazing camp program, I am participating in the Pedal on the Pier fundraiser so that the Harold Robinson Foundation can send kids from 20 different inner-city neighborhoods to camp, including Watts. My team and I will be riding 100 miles alongside many others in order to raise money for this great cause. Please, if you have the ability, help support giving the kids in Watts this opportunity. It only takes a minute to donate and no donation is too small. Seriously. Every dollar counts and will move us closer to providing this experience to so many deserving and wonderful kids." $ 500.00 Melissa lives on!